As a healthcare provider, therapists need to be aware of the potential impact of the recent Supreme Court ruling; some of which we know now and some of which we will find out in the years to come. As you can see by the timeline below…over the next three years, payment to doctors, cost control measures, Medicaid expansion and eventually a pay for performance or outcomes methodology will be implemented. These changes will impact the care we provide and the overall continuum of care that the patients experience. Gone are the days that therapy is just paid for because it was ordered and provided; the national healthcare system must be focusing on coverage, access, quality and cost containment as reiterated by the APTA. Our associations (APTA/AOTA/ASHA) are advocating that rehabilitation services are an integral part of healthcare services. We will continue to provide updates and information as it becomes available and certainly encourage you to stay in touch with your professional associations as well. 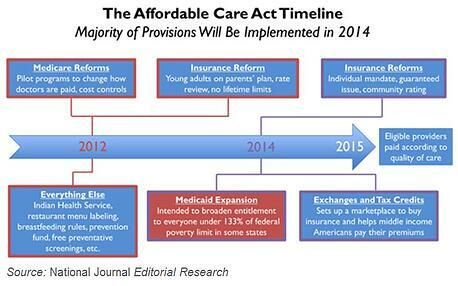 The timeline—above- is from the National Journal presentation and taken from the APTA website.